Once considered a luxury, ceiling fans have an unmistakable prominence in our daily lives today. Over time, the humble ceiling fan has beautifully evolved to suit different weather conditions, style and comfort needs of man. Today, the ceiling fan occupies a daily part of our lives, helping us feel comfortable and well-ventilated all day and night. This article will help you to choose that perfect ceiling fan for your bedroom – one that would be a perfect match to your decoration preferences and comfort needs. Before we start, let us simplify a few key technical terms for you, so it is easier to understand the article as we go along! When it comes to ceiling fans, air flow is everything. A ceiling fan’s worth is decided by its ability to circulate air as efficiently as possible. This is perhaps the most important technical term to get an understanding of. The pitch/blade pitch is the angle at which the fan’s blades are positioned. This angle decides the efficiency at which the fan will circulate air. The more the blade pitch, the better the air flow capacity of the fan. The blade angle also influences the motor efficiency, so it is best kept at an optimal value setting. Ceiling Fan Ratings are important markers that qualify a ceiling fan for a particular environment. Ceiling Fans today are available in a variety of ratings based on the installation location and weather conditions. These UL certified ratings are: UL Dry-Rated, UL Damp Rated, and UL Wet-Rated Ceiling Fans. Dry Rated Ceiling fans are perfect for indoor environments, while Damp and Wet Rated Ceiling Fans are suitable for the outdoors. Damp Rated ceiling fans are meant for areas like porches and other covered outdoor spaces, and have moderate tolerance for humidity and damp weather. On the other hand, Wet Rated ceiling fans are tougher, and can withstand heavy snow, rain, ice and other harsh weather conditions. 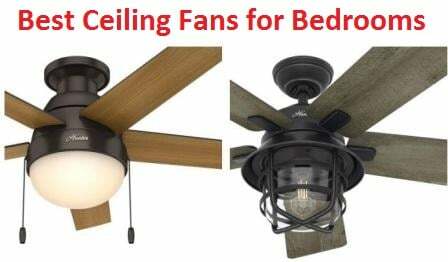 If you are looking for a ceiling fan for your bedroom, dry rated fans are the way to go! The CFM (Cubic Airflow per Minute) is the exact measure of the amount of air moved by the fan per minute. This is also called the airflow rating or flow rate, and is a perfect way to estimate a Ceiling Fan’s efficiency. So to put it short, higher the CFM, greater the ability of the ceiling fan to ventilate, heat or cool a particular space. DC motors are popular, light and efficient, and are the standard choice for high-performance ceiling fans. These have the ability to generate a high torque, and consume about 70 per cent lesser energy than standard AC motors. Another popular category while considering energy efficiency is the Energy star rated ceiling fan. These fans use lesser energy than standard fans and must meet strict airflow requirements. Another special category of fans include the high airflow fans- for special needs such as to drive away mosquitoes and backyard pests. There are many important points you have to consider if you want to make a wise ceiling fan choice. Today, a lot of ceiling fans come with attached lighting kits. These could be very helpful if you could use a burst of extra lighting for your space. The lighting kits included as a part of a ceiling fan can be halogen light, fluorescent or LED bulbs. Choosing one among these is highly a matter of personal taste and preference. Halogen Lights are pretty common choices and emit warm lighting. These run for an estimated 1500 hours. Florescent and LED lighting sources emit cool or warm lighting. While florescent bulbs use less energy (75 per cent lesser than halogen light sources), LED lights consume even lesser energy. You will be surprised to hear that LED light sources have a life of about 50000 hours. While selecting a ceiling fan for your personal space, factors like sizing, location, and support play a very important role in ensuring your safety and comfort. We address each of these below. While installing a ceiling fan, there are certain sizing rules you must follow to ensure optimal airflow and ventilation for your space. The general rule states that the size of the ceiling fan is directly proportional to the square footage of the room. If the size of your room is lesser than 144 square feet, a best fit, 42-inch fan will be the best fit. Whereas, if the room measures between 144 and 225 square feet, a 44-inch fan is your best bet. Any space greater than this, can comfortably use a 52-inch fan. Another rule states that if the installation space is greater than 18 feet in length, two medium sized fans would keep the area well-ventilated. Ceiling fans work best when they are positioned in the middle of a room. For fair performance, it is necessary to make sure that the blade tips are positioned at a minimum distance of 24 inches from sloped ceilings or walls. It is also recommended that fans not be mounted too close to the ceiling. Following optimal ceiling height rules will result in optimal performance and safety for the inhabitants of the space. If your ceiling height is between 8 and 10 feet, a standard mounting is preferred. But if your ceiling is less than 8 feet in height, a flush mount application can be installed. On the other hand, if your ceiling height greater than 10 feet, a down-rod can be installed to bring the ceiling fan to an optimal height. One important point to be noted during ceiling fan installation is that, the height from the floor to the ceiling fan is always 7 feet. With their centrifugal action and heavy weight, a strong ceiling support is mandatory for your fan. Ceiling fans are best hung from light fixture boxes on framing members, or special hooks and crossbars meant for ceiling fan installation. Today, ceiling fans are available in a variety of sizes, styles and finishing, suiting various tastes, preferences and budgets. Ceiling fans these days have two or three blades to as many as nine blades in some special models. While it may seem that more blades equate to better performance, it is rarely the case. As discussed earlier, the amount of air flow is determined by the pitch of the fan blade and its ability to effectively move air around. As the number of blades of a ceiling fan increases, the ceiling fan’s ability to circulate air reduces. Thus, it is most preferable to choose a classic blade count of three or four blades for optimal air flow and ventilation. Ceiling Fan blades come in different styles and shades to suit the aesthetics of your living space. Some ceiling fans also have reversible blades to switch between two different looks when needed. Ceiling fans are available in different styles and finishing to suit the buyer’s personal style and taste. Some ceiling fans come with appealing and decorative light shades made of frosted glass, alabaster glass or seeded glass. They also come in various finishing such as auburn, brushed nickel, antique bronze, matte black, Auburn and many others. Ceiling fans are also available in a range of colors, designs and patterns to suit buyer budgets and tastes. These range from Antique and rustic designs to contemporary and classic shapes and patterns. Choosing the right design is a great way to complement your décor and aesthetics. Ceiling fan accessories and controls is another factor you should consider based on your daily habits, installation location and inhabitants of the living space. The most common accessories associated with ceiling fans include adapters and down-rods for angled and high ceilings. A lot of ceiling fans come with down-rods that can be used with high ceilings. Another common accessory or add-on available with a ceiling fan includes light kits, or light kit compatibility for future installations. Many ceiling fans today are remote control compatible, thus adding more comfort and convenience to their operation. Some others also come with decorative pull chain systems. The most common controls are wall mounted controls, and these are most suitable for families and multipurpose areas, and in homes. When it comes to beneficial features, ceiling fans have plenty. If you live in a region that sees extreme summers and winters, it may be a good idea to invest in a reverse rotation capable fan. 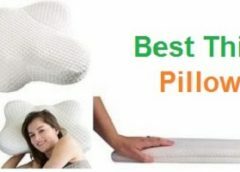 These are great for adjusting with the changing seasons. With a reverse rotational fan, you can set your fan to rotate in the clockwise direction during the winters, and counter clockwise in the summers. Now that you know the fundamentals well, let’s start exploring some of the most popular ceiling fans available currently. The Haiku Home L Series Ceiling Fan is a 52 inch smart fan suitable for indoor spaces with dimensions of 15 x 15 feet with sloped or flat ceilings. It works best at an operating temperature between 32 and 104 degree Fahrenheit, and an operational humidity (non-condensing) range of 20 to 90 per cent. The design of the Haiku Home L Series Ceiling Fan is both stylish and efficient, and includes a number of intelligent accessories and features. The smart Ceiling fan is both IR remote controllable as well as Alexa compatible. It also features a factory balanced, sound-tested design and precision-balanced airfoils which makes sure that the fan doesn’t rattle, wobble or click during use. The Haiku Home L Series Ceiling Fan is great for adding supplemental heat during winters in spaces like cold rooms, sun rooms, additions or cabins. It features an integrated LED light kit and a sound-tested, silent motor with a chain free design. The L-Series Haiku Home Ceiling fans use a super-efficient Axial-Flux, permanent magnet motor as well. These smart ceiling fans have an epic design, and come in attractive colors like glossy white, matte black, caramel finish, and cocoa finish. The Haiku Home L Series Ceiling Fan has a high-performance design which exceeds regular energy-star requirements by 450 per cent. Its integrated LED module is highly efficient and produces two times the light produced by an ordinary incandescent bulb. What’s more, this LED module has a lifespan that is 30 times more, and spends nearly just half the energy an incandescent bulb does. The Haiku Home L Series Ceiling Fan has an extremely durable build and is tested in thermal chambers with temperatures between -4 degrees Fahrenheit to 122 degrees Fahrenheit. The Haiku Home L Series Ceiling Fan has an epic stylish construction and a value-added feature set. It comes with an integrated LED lighting kit with 16 distinct levels of brightness. It allows voice control through Amazon Alexa and an IR Remote system as well. The IR Remote system has ten control settings to control the timer, speed, sleep mode, and a handy whoosh mode that simulates a natural breeze. The smart fan can also be controlled by the Haiku Home mobile app that can be installed on your smart phone. This classy decorative ceiling fan from RainierLight is everything you need to make you living space artsy. Suggested for spaces in the range between 106 to 322 square feet, the ceiling fan is ideal for spaces like your living room, foyer, dining room, villa, and bedroom. Apart from homes, the ceiling fan is great for multi-style rooms as well as restaurants. The RainierLight Classical Crystal Ceiling fan features 5 reversible metal blades along with an attached chandelier-style LED crystal light kit. This ceiling fan comes complete with a remote control, wall control and a drawstring for operation- whichever appeals to your need for convenience and comfort. It also comes with two down rods- one that is 4.7 inches long and another that’s 9.8 inch long. The RainierLight Classical Crystal Ceiling fan incorporates a reversible motor made of silicon steel and pure copper and imported bearings. The RainierLight Classical Crystal Ceiling fan has an efficient design and is built for dust collection and rust resistance. The fan is energy efficient, made up of flame retardant material, and provides great insulation. Also, this is an eco-friendly fan that is safe, non-toxic, non-flammable and meets environmental standards. This RainierLight Classical Crystal Ceiling fan also features a heat sink hole. This is to prolong the life of its motor and to reduce the internal temperature of the host. This stylish decorative ceiling fan is a three functional fan – offering three adjustable speeds (high/ medium/ low). The crystal lights attached to the fan are very pretty, and the fan makes a great add-on to any space in your house. 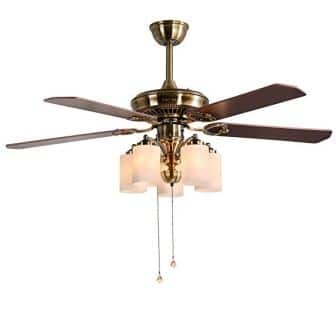 Overall, the RainierLight Classical Crystal Ceiling fan is a delicate, beautiful and classy ceiling fan that is sure to add more elegance to your personal space. This Hunter Ceiling Fan is meant for the outdoors, and has a very practical and sturdy construction. Meant for both indoor and outdoor (covered) spaces, the ceiling fan is made of stainless steel for rust resistance. It has a weathered, rugged zinc finish, and features 5 reversible blades that are burnished and made of grey pine. The Hunter Zinc Outdoor Ceiling fan comes with a light kit (integrated) that uses a 5 Watt LED bulb (included), and is made of clear glass. The ceiling fan also includes a remote control to adjust the fan and light settings to an optimal level. The Hunter Zinc Outdoor Ceiling fan is perfect for areas such as covered porches, patios, and indoor spaces like living rooms and bedrooms. This farmhouse style ceiling fan has a practical and efficient construction, and a well-rounded operation. The LED on this Hunter fan is different from normal white-glow LEDs. The lighting kit on the Hunter Zinc Outdoor Ceiling fan emits a warm and lovely orangey glow. Overall, the ceiling fan has a low noise, no-wobble, efficient and powerful operation. The Hunter Zinc Outdoor Ceiling fan is damp rated, and is adaptable to both indoor and outdoor (covered) environments. Its vintage detailing and rustic finishing is quite classy and elegant, and adds a nice touch to the space it is installed in. The Hunter Zinc Outdoor Ceiling fan features reversible, stylish blades, as well as a fan and light adjustment remote (handheld). 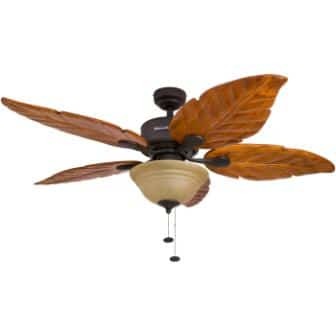 The Honeywell Sabal Palm ceiling fan is a 52-inch, tropical style fan that comprises of hand carved blades with basswood/Lindenwood and an elegant bronze finish. The artistic ceiling fan includes a Tucsan sandglass bowl as well as three bulbs (40 watts each). With a 12 degree blade pitch, the Honeywell Sabal Palm ceiling fan offers a high amount of airflow and ventilation, thus minimizing the need for air conditioners and alternate equipment. 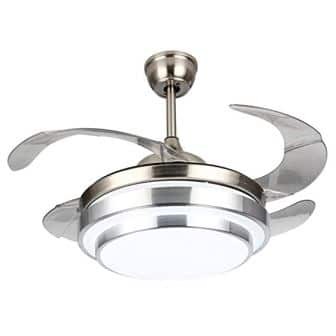 This ceiling fan is tri-mount capable, and can be conveniently installed using an included down-rod (4 inch), in an angled mount and a closed mount. The Honeywell Sabal Palm ceiling fan makes a great fit for medium to large spaces including dining rooms, living rooms, bedrooms and family rooms, and lights up the room with a tropical theme. The Honeywell Sabal Palm ceiling fan has an energy-efficient construction and an easy set up. With its artistic carved pattern and efficient blade pitch, this ceiling fan is a great addition to any space inside your home. The sunset glass bowl that is included as a part of the lighting kit gives out soft and balanced illumination. This Honeywell ceiling fan has an extremely eye-catching wooden design that gives any space an instant burst of tropical energy. The smart ceiling fan can be run optimally in both summers and winters using the benefit of its reversible motor system. The counter clockwise operation is ideal for summers, while the clockwise direction of operation is best for the colder winter months. The Andersonlight Modern Ceiling fan has a modern, chandelier style design and comprises of 4 wooden blades. It has a black, butterfly shape, sleek design and is very easy to assemble and set up. The Andersonlight Modern Ceiling fan comes with two down-rods – one of 4.9 inches and the other of 9.8 inches, a remote control, and five standard E26 bulbs. The attached chandelier style luminaire can be rotated 360 degrees. This ceiling fan is suitable for areas in the range of 80 to 400 square feet, and is ideal for spaces like the bedroom, living room and dining room. This Andersonlight ceiling fan uses a top notch motor made up of high quality silicon steel & copper wire. It is impressively silent, with the noise produced as low as about 47 decibels. The ceiling fan delivers some impressive air flow (about 5203 CFM). The Andersonlight Modern Ceiling fan has an attractive and specialized luminaire that achieves both concentrating as well as an astigmatic lighting effect. 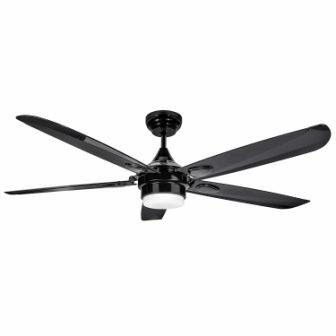 The Andersonlight Modern Ceiling fan has a special black coating to protect it from rust and corrosion. It is also covered with a special nano-dust technology to resist accumulation of dust. This Comet Ceiling fan is a sleek 52 inch fan that is best for bedrooms and other living spaces having an area of up 400 square feet (20 by 20 feet rooms). The ceiling fan can be used with 8-foot (standard) ceilings, and also has a dual mount construction. 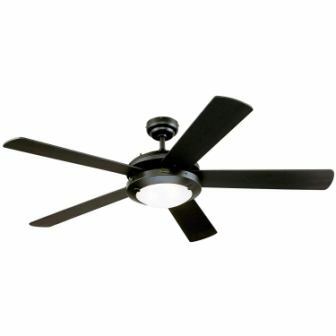 The Comet Ceiling fan has a traditional construction and a smooth, matte black finish. The five blades that comprise this ceiling fan have a reversible style, and have a length of 23.38 inches and a blade width of 5.38 inches. The ceiling fan also includes a remote control and a frosted glass light kit that’s placed inside an elegant matte black housing. Two torpedo candelabra bulbs (40-watt each) are included with this Comet ceiling fan. The traditional construction and well-rounded design of the Comet Ceiling fan ensures maximum performance and great airflow. With the elegant frosted glass light kit, the space gets illuminated with a soft glow. This Comet Ceiling fan also has a top-notch motor that delivers powerful air flow and ventilation, aside from being quiet and almost noise free. The Comet Ceiling fan has a versatile design that suits all kinds of indoor living spaces quite well. This fan is remote control compatible and also features a reverse rotation feature for optimal air flow during various seasons. The fan has a fairly simple installation process and comes with an easy to follow instruction manual. 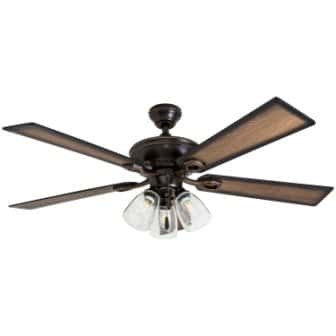 The Hunter 59244 Dempsey Ceiling fan is a low profile fan with a minimalistic design and construction. 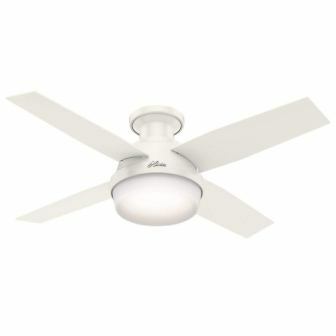 This 4-blade ceiling fan is designed for indoor use, especially with rooms with low ceilings. It has a low profile housing that is apt to fit flush to ceilings. The fan comes with an integrated lighting kit that sits inside a cased white glass bowl. Two 9.8 Watt LED bulbs are included along with this Hunter ceiling fan. The Hunter 59244 Dempsey Ceiling fan has a 44-inch blade span and includes a hand-held universal remote control for both fan and light operation. The Hunter 59244 Dempsey Ceiling fan uses a powerful WhisperWind motor for quiet operation, yet powerful ventilation. This ceiling fan is optimally designed for maximum airflow, thus delivering an average of about 2997 CFM of air flow. The LED bulbs inside the lighting kit offer optimal lighting and brightening of your space. 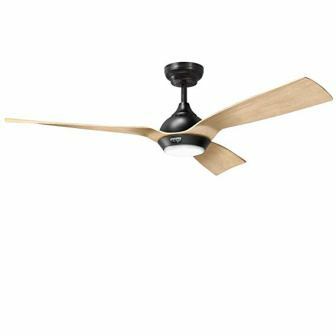 The Hunter 59244 Dempsey Ceiling fan’s unique WhisperWind motor eliminates unwanted buzzing and humming, thus maintaining peace and quiet indoors. The motor included inside this Hunter fan is reversible- i.e. it can switch between the downdraft mode (during summers) to the updraft mode (in the winters), with just the press of a button. This direction change feature comes very handy in regions that see extreme seasonal changes over the year. The universal remote control included with this ceiling fan can be used for both the fan and the lighting kit. The Hunter 59244 Dempsey Ceiling fan has a clean and elegant finish with contrasting angles to impart an inspiring look to your surroundings. Included LED bulbs are completely dimmable, thus offering you complete control over lighting needs. Also, Hunter Dempsey fans are available in a wide range of patterns and designs, to allow you to match décor, yet keep a consistent appearance across all spaces in your living space. The Reiga ceiling fan has a streamlined and elegant design. This is a 52-inch fan that is built for a down-rod mount installation. The two-position mount ceiling fan comes with two down-rods – a 10-inch down-rod as well as a 5-inch down-rod, a remote control, and a 12 Watt integrated LED light (6000 K and 1148 Lumen). This Reiga ceiling fan is fairly easy to install and is perfect for spaces like your foyer, bedroom, dining room, patio and sunroom. The three reversible oak blades of this ceiling fan are hand painted and made of composite board. This Reiga ceiling fan features a 140*20mm, high-power noiseless silicon steel DC motor for efficient and powerful airflow and ventilation. The fan also has a 14 degree ABS pitch for an increased level of airflow. The approximate airflow offered by this ceiling fan is about 5853 CFM. The ceiling fan is designed to have a very low energy consumption and a long service life. The remote control that is included along with this Reiga ceiling fan offers a variety of applications. In addition to simple functions such as on and off, the remote control can also be used to make 1/4/8 time function adjustments, 5-speed level changes and fan rotation direction control. In all, the Reiga ceiling fan offers great ventilation and air flow, thus helping you save on your ever-increasing heating & cooling bills. The FINXIN FXCF07 ceiling fan is a 52-inch bronze ceiling fan with a beautiful, vintage look and finish. This 52-inch ceiling fan includes five blades with an integrated lighting kit. Crafted from top-quality metal and a beautiful rose-color wood, the FINXIN FXCF07 ceiling fan is also made of durable temper glass. The FINXIN FXCF07 is remote controllable, and comes with a remote control for operation, along with an additional pull chain. 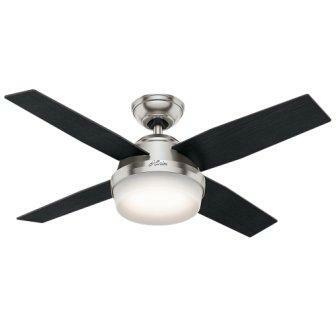 This ceiling fan is ideal for both down-rod as well as flush-mount installations. This FINXIN FXCF07 ceiling fan uses less energy (less than 100 Watts), and features a quiet but powerful motor. This motor is reversible thus enabling you to use the ceiling fan in all weathers across the year. Overall, the fan offers excellent airflow and ventilation, along with an impressive noise-free operation. The FINXIN FXCF07 ceiling fan comes with an easy to operate remote control as well as a pull chain for versatile operation. With a reversible motor function, this ceiling fan can be comfortably used across the year through the changing seasons. The FINXIN FXCF07 includes three light settings, and give off optimal, well-adjusted light in all the levels. This Prominence Home 40278-01 Glenmont Rustic Ceiling Fan has a beautiful rustic finish, which is perfect for adding an elegant, vintage look to your space. Constructed with top quality barn-wood blades and a classy oil rubbed bronze finishing, this ceiling fan is great for rooms up to 350 sq. ft. of space. 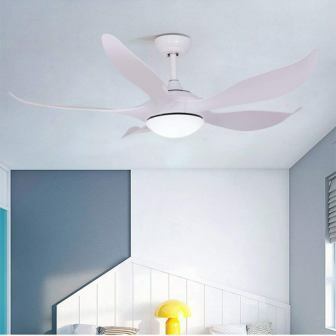 The ceiling fan ideal for medium sized bedrooms, living rooms, family rooms, dining spaces and other living spaces too. The ceiling fan comprises of a two blade finish- that is, these blades are reversible in nature. With this unique style combo, you can easily give your room a makeover, or switch styles to complement your unique room décor. 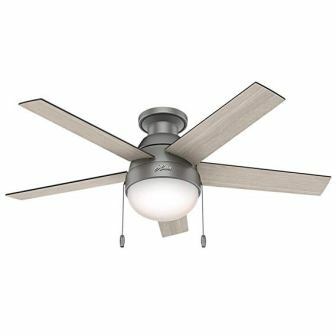 The Prominence Home 40278-01 Glenmont Rustic Ceiling Fan has clear, beautiful and modern looking branched seeded light fixtures. The lighting kit that is included comprises of three B10 Edison bulbs (Vintage) and E26 base. This rustic, well-constructed ceiling fan has an impressively quiet operation and delivers great air flow and ventilation. Its energy-saving design helps you save up on ever increasing heating/cooling fuel costs, along with imparting a lovely, aesthetic finish to your space. 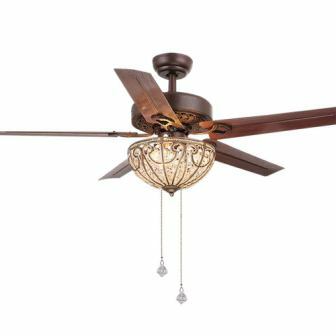 The Prominence Home 40278-01 Glenmont Rustic Ceiling Fan features an impressively quiet three speed motor that is reversible in nature. This means that you can conveniently adjust the direction in which your fan blades run for maximum comfort with the changing seasons. The Hunter 59270 Ceiling fan features a WhisperWind motor for minimal noise and powerful air flow. This ceiling fan comprises of five reversible blades with a13 degree pitch for optimal movement of air. These blades are lighter colored on one side (oak grey) and darker on the other side (walnut grey). The ceiling fan unit also comes with a minimalistic globe shaped lighting kit and includes 2 CFL bulbs. The WhisperWind motor features a low profile housing/hanging system that can be fit to flush ceilings or rooms with a low ceiling. The Hunter 59270 Ceiling fan has an elegant, minimalistic design and is operable with the help of a pull chain that comes along with the ceiling fan unit. The Hunter 59270 Ceiling fan comes with a reversible WhisperWind motor for powerful air movement along with a noise free operation. Also, the ceiling fan offers great ambient lighting with its minimalistic, integrated lighting kit. Perfect for low ceilings, the Hunter 59270 Ceiling fan is a classy addition to a contemporary décor. It is perfect for small and standard size rooms, and works with a pull chain system (included). The ceiling fan can be upgraded to be remote control functional (to be purchased separately). Its reversible motor operation comes very handy during seasonal changes, and the reversible blades are great for décor changes or makeovers. The Hyperikon Contemporary Ceiling Fan is a 56-inch fan, and has a strong and heavy duty iron-cast body. This sturdy ceiling fan comes with 5 highly durable ABS blades, each of whose length measure 22.8 inches. The height of the fan from the ceiling measures 21.7 inches. The Hyperikon Contemporary Ceiling Fan comes with a built-in, integrated lighting kit that comprises of the LED light bulbs. These bulbs use the latest COB Diode Technology eliminating the need for bulb replacement. Also, this Hyperikon fan comes with a versatile remote control for convenience and comfort. The Hyperikon Sleek LED Ceiling Fan features an integrated 12 Watt LED lighting kit that emits 1020lm of 4000K natural white light. This ceiling fan features a powerful, noise-free 38 Watt DC motor that helps deliver a CFM of 2,060 and air flow efficiency measuring about 54 CFM/Watt. The motor is reversible as well, and thus helps save on energy and fuel costs with artificial heating/cooling equipment. This Hyperikon 56-inch ceiling fan comes with an additional remote control for easy and convenient operation. The versatile remote control has multiple options for its user like six varying speed levels, light on-off switch, reverse spin direction, and timer functionality. Its reversible control feature comes handy when you want to change the ceiling fan direction from downward (in the summers) to upward (in the winters). Overall, this sleek ceiling fan is a great choice if you are looking for a simple, sleek and stylish addition to your home furnishing needs. The Hunter 46 inches ceiling fan has a compact, solid construction and design. It comprises of five light grey oak/grey walnut blades that are reversible as well. The set up includes an integrated lighting kit and cased white glass. The ceiling fan includes two 9 Watt LED light bulbs (dimmable) as well. The structure of the Hunter 46 inches ceiling fan is perfect for low profile ceilings, and can be installed with a flush setup. A handy pull chain is included along with the ceiling fan for easy on/off and other adjustments. The Hunter 46 inches ceiling fan includes a WhisperWind motor for quiet and effective operation. This motor is known to deliver an exceptional level of airflow and increased ventilation. This Hunter ceiling fan comes with a handy pull chain for versatile and easy operation. The pull chain can be used to select speed levels, switch device on/off and make other operational adjustments. The integrated light kit that comes included as a part of the ceiling fan is dimmable in nature. Overall, the Hunter 46 inches ceiling fan is great if you are looking for a simple, effective option for your kitchen, living/dining room or bedroom. The Fandian Modern Ceiling Fan has a highly stylish, solid and decorative frame. It is a 42-inch, 4-blade fan that is best for living spaces like bedrooms, living rooms, bar and restaurants, villa yards, cafes, offices and shops of approximate area in the range of 8-25 square meters. This Fandian ceiling fan comprises of a metal top, ABS acrylic blades, a sturdy aluminum frame and stylized acrylic blades. It also features an Acrylic PVC Lampshade and an LED lighting board. The fan has a very minimalistic design- the blades retract when the fan is switched off, and they are hardly seen when the fan is running. This ceiling fan has a safe and stable construction, and a fully enclosed, compact design. With an optimal output of warm white light, the Fandian Modern Ceiling Fan is quite silent in its operation. The ceiling fan delivers a good amount of airflow and ventilation, and helps save on heating/cooling expenses. 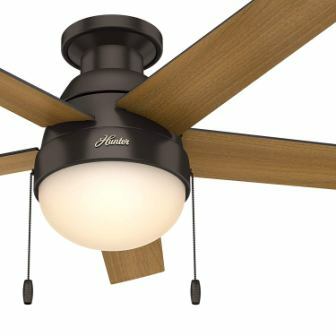 The Fandian Modern Ceiling Fan has three light options (color options) – cool, warm and mixed. With a retractable option for its blades, this ceiling fan comes with a handy remote control for easy operation. Overall, the Fandian Modern Ceiling Fan is great if you want to make an impressive, yet minimalistic style statement. The Hunter 59245 Ceiling fan is a 44 inch indoor ceiling fan that is most suitable for small spaces and homes with low ceilings. It is comprised of four reversible blades, with a black oak finish on one side and a chocolate oak colored finishing on the other. Overall, the finishing is smooth, clean and elegant. The Hunter 59245 Ceiling fan has a blade pitch angle of 13 degrees and comes with two down rods- (3 inch and 2-inch down rods). This Ceiling fan includes a WhisperWind motor known well for its efficient airflow delivery and top-notch cooling power. The 13 degree blade pitch also ensures optimal air flow and ventilation. 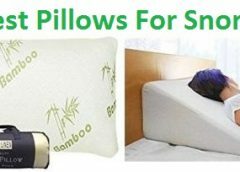 It has a smooth operation and is well-balanced and sturdy. 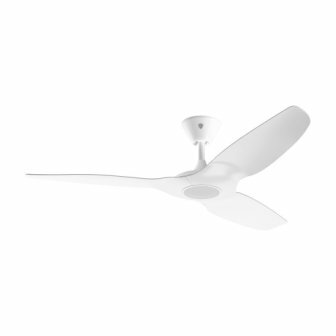 The Hunter 59245 Ceiling fan includes a WhisperWind motor that is reversible in operation. This means that the direction of blade rotation can be changed in accordance with the varying seasons. This feature enables the user to easily change from updraft mode during hot summers to a downdraft mode in the winters. The Hunter 59245 Ceiling fan also includes a universal remote control that features a number of versatile options for convenient operation and control. Also, this ceiling fan is great for low profile ceilings and smaller living spaces. The LED lights are fully dimmable, thus giving users a total control over the illumination level and lighting. Pre-assembled fans usually make for easier installation. When installing your ceiling fan, make sure you follow the manufacturer’s instruction label carefully. Also, follow all care and safety instructions to stay safe during the installation and setting up process. Make sure you check the ceiling fan’s operational noise level before you purchase one. Make sure you have a metal outlet box. Most ceiling fans require metal outlet boxes. Ceiling fans that are designed to be used outdoors can mostly be used indoors. But indoor-rated ceiling fans should not be used outdoors. If you want to install a ceiling fan on your patio or porch, make sure you use an outdoor ceiling fan. This will make sure that your fan is strong enough to face the natural elements it is exposed to. Check if the junction box reads as “suitable for fan support”. These junction boxes are stronger than light fixture boxes. LED lighting kits are always better than traditional ones. They have longer lifespans and help you save on additional costs. Look for the Energy-star certification on your ceiling fan. Some ceiling fans have the automatic temperature adjustment feature. This is a great to have feature, and ensures energy efficiency and comfort. If you have a sloped ceiling, check if your fan is compatible for the same. Same applies for low ceilings and flush mounts. Many ceiling fans these days have more than 5 or 6 blades. It is helpful to note that more blades do not indicate better air flow.